Turkish chef Nusret Gökçe, better known as seasoning sensation ‘Salt Bae’, is to open a London outpost of his popular Nusr-Et steakhouse chain. Gökçe shot to fame a year ago when a video of him flamboyantly seasoning a steak by letting the salt trickle down his forearm onto the meat sent the internet into overdrive. The video of the as-yet-unknown chef was viewed 10 million times on Instagram and became a much-used meme, making a celebrity of Gökçe, who has been nicknamed ‘Salt Bae’. “The shape of the meat and the taste of it starting from the top down is a part of me. 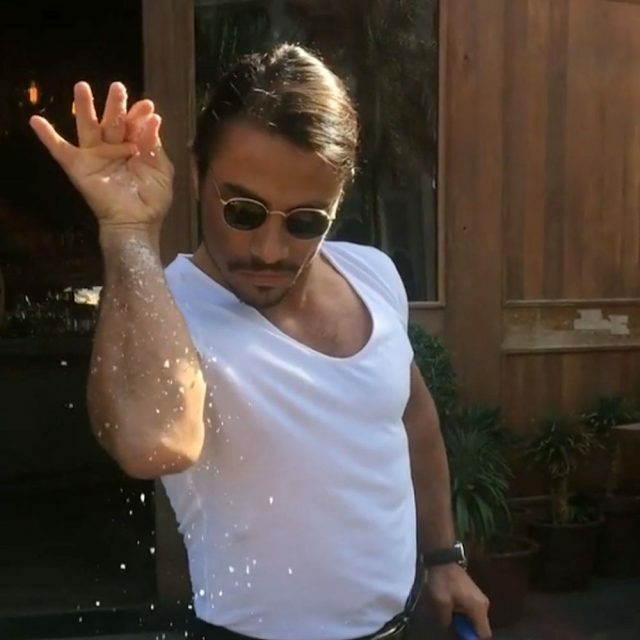 All of my feelings are coming from inside of the meat down to when I put the salt onto the meat,” Bae told NBC in an interview last February with regards to his eccentric seasoning flourish known as “the move”. According to Hot Dinners, the chef is hoping to capitalise on his fame by opening a London outpost of his Nusr-Et steakhouse chain at The Park Tower in Knightsbridge. Among Salt Bae’s signature dishes on offer in London will be roasted asaado short rib, Nusr-Et meat spaghetti, lokum, and the ‘Nusr-Et special’, whatever that might be… If you’re really lucky you might even get your short rib seasoned by the great man himself. A trained butcher and chef, Gökçe has built up the Nusr-Et chain and now boasts sites in New York, Dubai, Doha and Miami. He counts actor Leonardo di Caprio among his fans. His first steakhouse opened in Istanbul in 2010. According to Unilad, Gökçe is married with nine children.